Is your family a fan of the Hotel Transylvania movies? My son wanted to see the newest one, Hotel Transylvania 3, and lucky for him it is now out on digital and coming to DVD and blu-ray on October 9th. 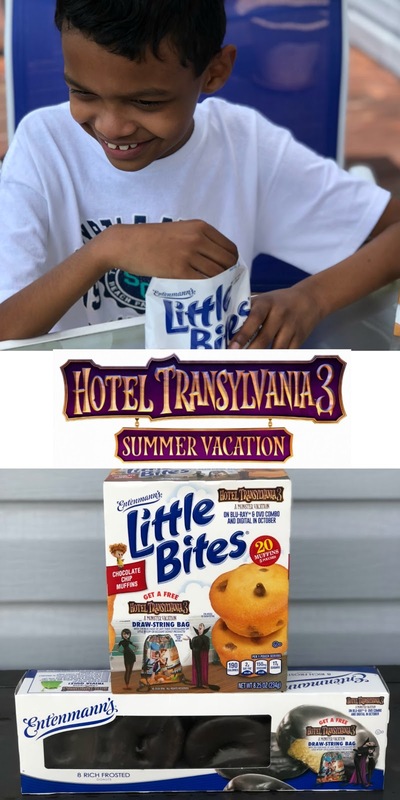 Entenmann’s Little Bites and Hotel Transylvania 3 have partnered and launched a frightfully fun offer to celebrate the DVD release of Hotel Transylvania 3. From September 1, 2018, through October 30, 2018, with the purchase of any three five-count Entenmann’s Little Bites or three eight-count Entenmann’s donut products, you will have the opportunity to receive a free HT3 draw-string bag. 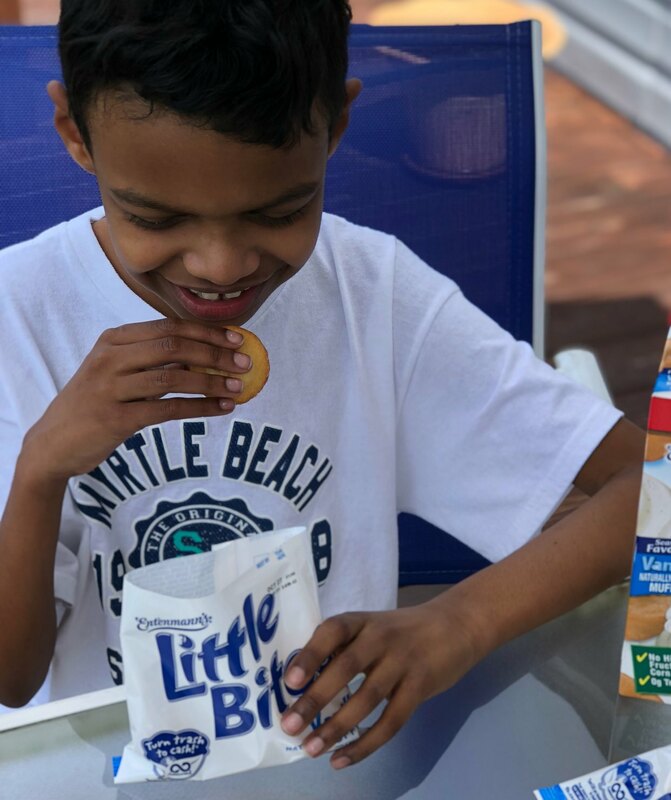 I don't know about you, but we are huge fans of Entenmann's Little Bites. There are so many delicious varieties to choose from. We especially love the limited edition vanilla muffins because they remind of us bite-sized pound cake. So delicious! They are super convenient since they are individually packaged. I sneak a pack in my husband's work lunch bag as a mid-day snack to go with his green tea. Entenmann’s makes a variety of delicious, cake style donuts such as Rich Chocolate Frosted, Crumb and Powdered. For more information about the promotion and to access fun and FREE Hotel Transylvania 3 activities, be sure to visit the Entenmann's website. One Mom Files reader will win a $25 virtual Visa gift card ,(2) coupons for $5.00 off the purchase of any Entenmann’s Little Bites, and (1) coupon for $7.00 off the purchase of any Entenmann’s Donuts. Disclosure: The coupons for product redemption, information, and gift card have been provided by Entenmann’s Little Bites. The opinions expressed in this post are my own and do not reflect the opinions of Entenmann’s Little Bites. Party Bites are so good and colorful. My favorite Entenmann's product is blueberry muffin. I love Entenmann's lemon crunch cakes. I sometimes have a hard time finding them, but they're worth the search. I love the Bluberry mini muffins. I like any entenmann's products that are pumpkin or birthday cake flavored. I love their blue berry muffins bites! My favorite are the crumb donuts. I like Entenmann's marble loaf cake. Crumb Coffee Cakes are my favorite Entenmann's product. I enjoy the pound cake. My favorite Entenmanns product is their Little Bites chocolate chip muffins! My favorite is the Raspberry Danish. Chocolate chip Muffins my kids absolutely love. The selection is limited in my area to Little Bites and frosted donuts, but I would love to try their crumb cakes. I like Entenmann's chocolate donuts. I love the Crumb Cake and my son loves Little Bites, all flavors. Too many to list, but one of my faves is the chocolate chip Little Bites. Our little one is love with the Chocolate Chip Mini Muffins! I love the entenmanns chocolate chip muffins so much. The brownie bites are also very good. I love Entenmanns little bites blueberry muffins! Our whole family loves the lemon crunch cake. Thank you for the chance to win! I love the chocolate donuts from Entenmann's. All of the are really good! Blueberry Little Bites are my favorite. I love their mini chocolate chip muffins! My favorite Entenmanns product is their Little Bites chocolate chip muffins. They have great eclairs if you can find them. The chocolate chip little bites. My favorite Entenmann's Little Bites is the blueberry muphin ones they are all so good. Thanks so much. The blueberry muffins are amazing. I like their little bites! Chocolate covered donuts are the BEST!!!! I really like the wild blueberry mini muffins. I've loved the chocolate glazed donuts since I was a little girl. My daughters love the Little Bites blueberry muffins. I like the small packs of Chocolate Chip Muffins which are perfect for a snack or on the run because they travel well. I love their blueberry muffins. My favorite is Fudge Brownie Little Bites. My favorite Entenmann's product is their chocolate covered donuts. Chocolate Chip Little Bite are my favorite. I'm a chocoholic so the fudge brownie bites are my favorite but these sound good too! The chocolate covered mini donuts are my favorite. Now i'm hungry! I love their chocolate muffins. I love their Strawberry Yogurt Muffins. The crumb cakes are my favorite! ! My favorite Entenmann's product is their coffee cake. Thanks for the giveaway! i love the black and white cookies, they are really good. My favorite is Little Bites brownie bites. My son loves the blueberry muffins and party cakes. I love Entenmann's Chocolate Fudge Iced Cakes. My personal favorite would have to be the little blueberry muffins. The little bites are so delicious. Any flavor! My fave is the chocolate frosted donuts. I love the banana nut muffins. my family likes the blueberry muffins. My kids love the chocolate chip muffins! I love the doughnuts and the blueberry muffins the most. Their lemon crumb cakes are very good, not too sweet or cloying. My kids just love the blueberry muffins. I like the brownie bites best! My kids love the muffins, both chocolate chip and blueberry. My favorite Entenmann's product is their snickerdoodle little bites! My favorite is the cinnamon rolls, my mom always got them every week. I love the apple cider donuts. Wish they were available all year. My favorite Entenmann's product is their GLAZED BUTTERMILK DONUTS. I like the pumpkin donuts. My favorite product is the chocolate chip muffins. I love the chocolate chip muffins. They are so good. I love the powdered Pop'ettes. I like their Blueberry Muffins. My kids like the Brownie Bites. My favorite product is the CRUMB TOPPED DONUTS, but I also really enjoy the Blueberry Little Bites! My favorite is the Blueberry Mini Muffins! I love all their products, but the Party bites make me happy!!! My favorite is the little bites blueberry. my favorite is the raspberry Danish twist. I like the Little Bites blueberry muffins!